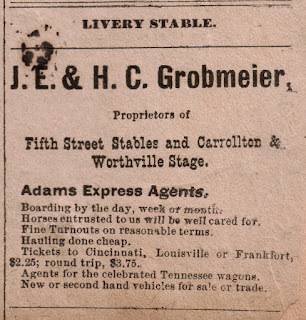 Little Sarah Eva Howe could hardly escape knowing about the thriving businesses in her home town of Carrollton, Kentucky. 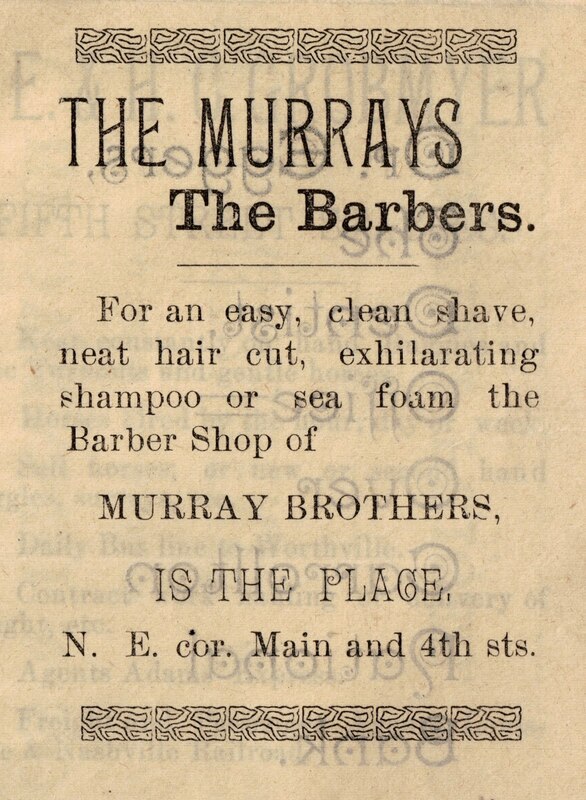 Her grandfather John Howe and John's five sons (including Sarah's "Papa," Robert James Howe) were prominent in local banking, textiles, custom-made suits, the manufacture of jeans, and retail sales. Some of the women in the family were business owners and managers, too, or owned stocks – and all of them likely had influence in business decisions made by their fathers, husbands, and sons. 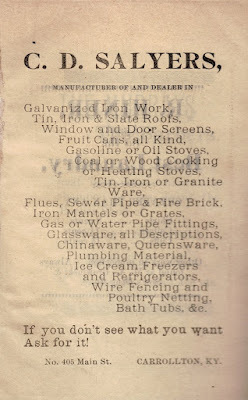 No wonder, then, that Sarah's scrapbooks about growing up in 1890s Carrollton are rich with clippings and notes about large stores and small shops, manufacturing and merchandising, banking and finance. At every family gathering, the conversation likely turned to business matters – and Sarah was the kind of child who would have soaked up every word. 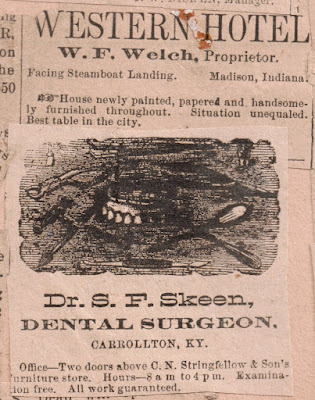 The ads she clipped from the Carrollton Democrat newspaper and pasted into her scrapbooks guide us on a virtual tour of the Carrollton business district of that time. They also tell us much about the Howes, their extended family, their friends, and their neighbors. 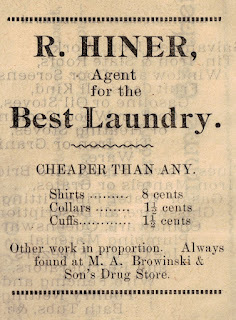 Of course, Sarah saved many ads representing Howe Brothers, the place in Carrollton to buy men's and ladies' fashions from New York and other big cities. We'll explore those another day. 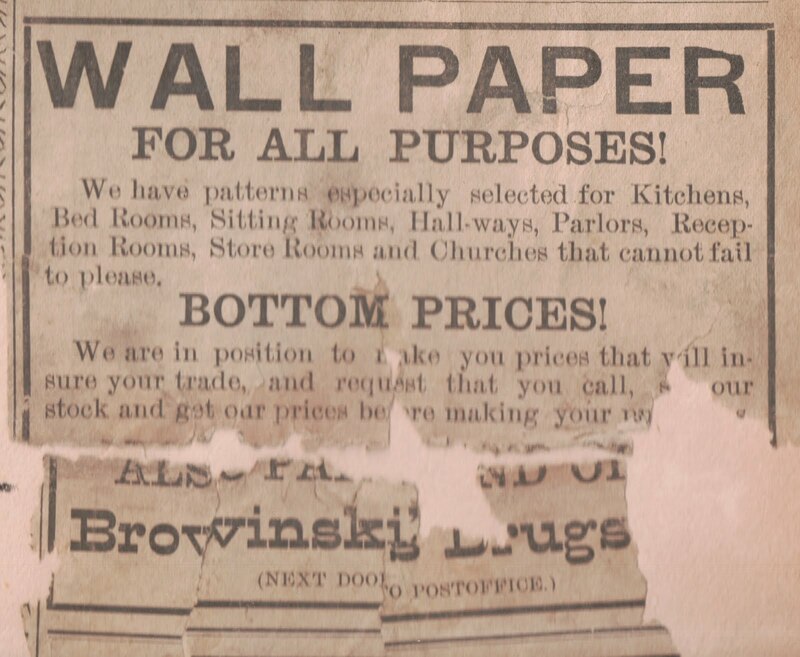 Today we'll visit other businesses in town – all of them owned by Howe relatives, friends, or neighbors. Our first stop is a pharmacy, M.A. Geier & Company. Now we proceed to M.A. 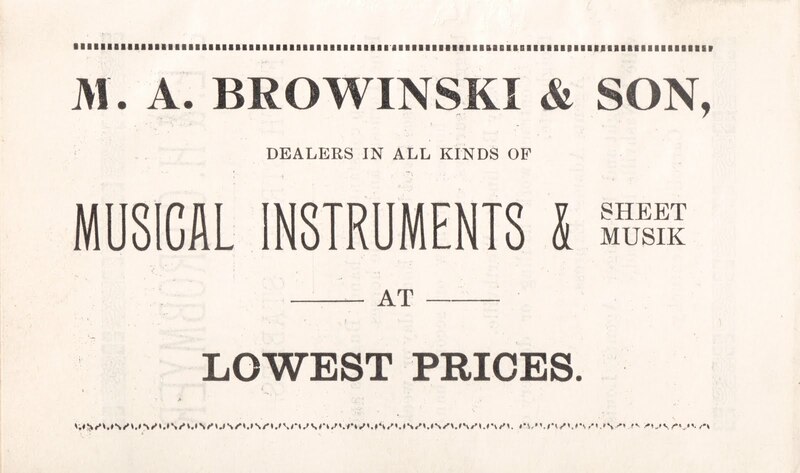 Browinski & Son, purveyors of musical instruments and sheet "musik." 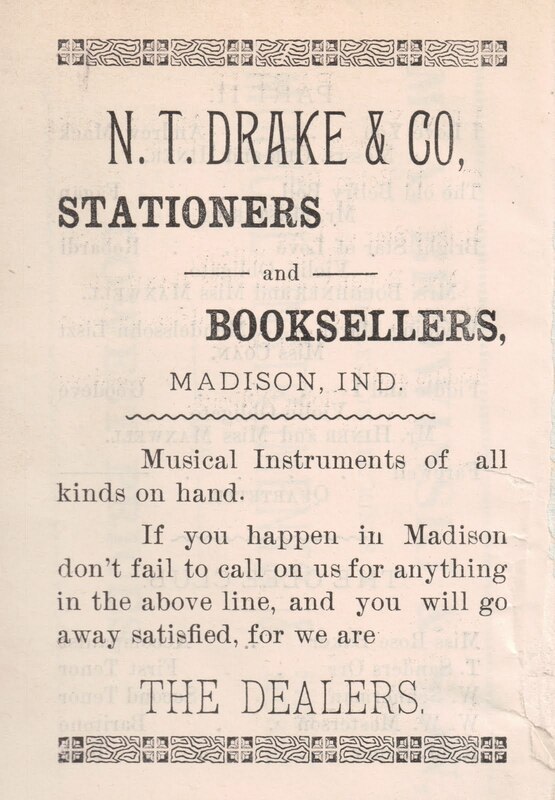 (Note: This ad comes not from a newspaper but from a school event's program booklet.) We'll also pass by Browinski's Drugs. Both of the "M.A.s" of the drugstore were the women of the family. M.A. Browinski was Mrs. Mary Browinski, Miss Sue's mother. Her son Anson of course ran the business at this time. M.A. 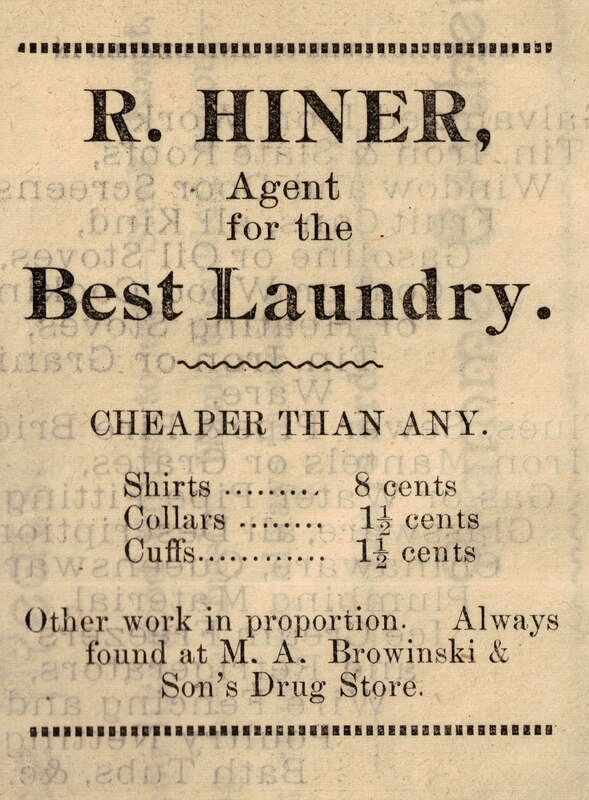 Geier was Miss Mary Alice Geier, whose brothers stayed in the store tho Miss "Jule" went into the grocery business about 1890 or 91. Mr. Oscar Geier had a partnership with the Driskell Bros in the Ghent Pharmacy. 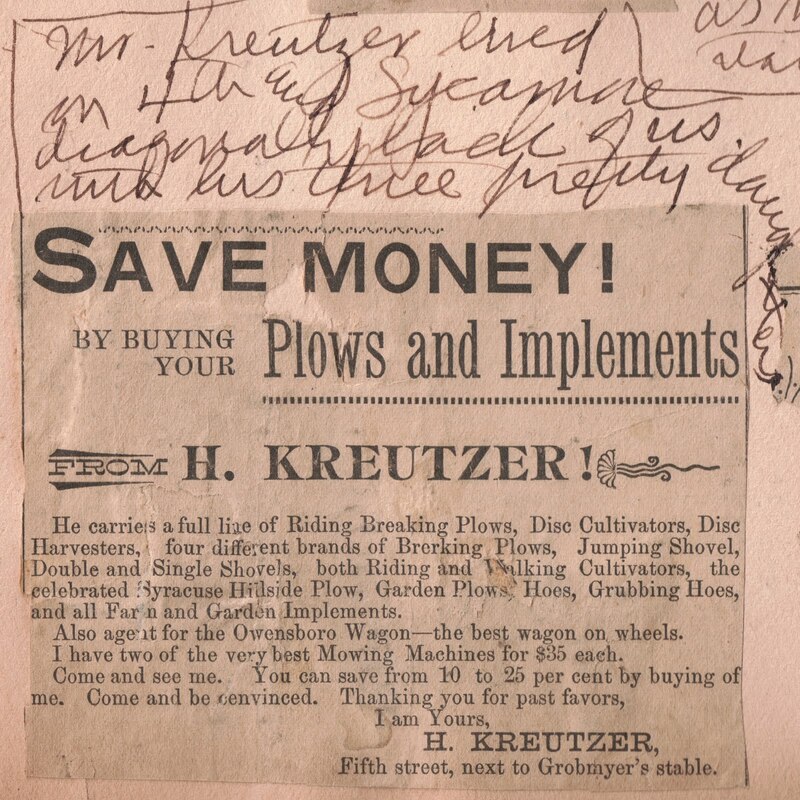 Sarah remarks about the ad on the right: Mr. Kreutzer lived at 4th and Sycamore diagonally back of us with his three pretty daughters. Mr. Kreutzer also advertised his blacksmithing skills. 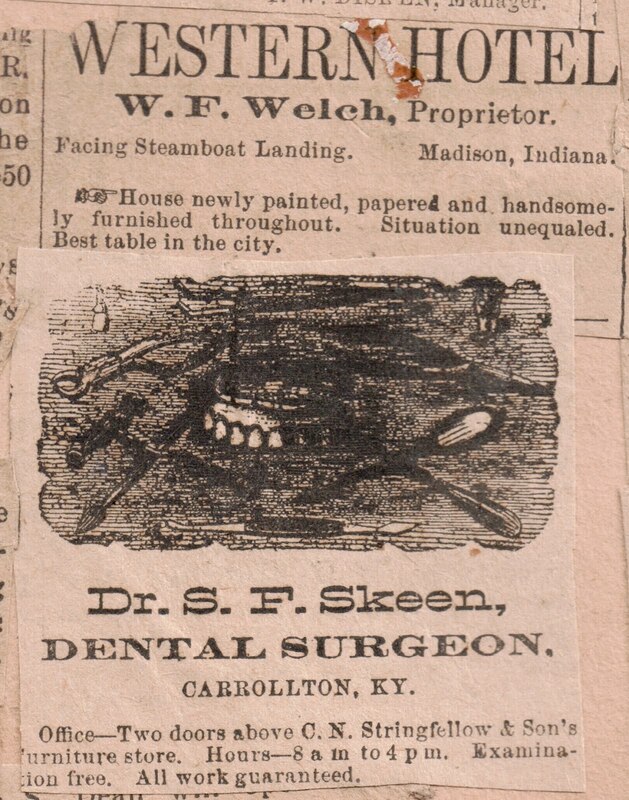 Steam-powered paddle boats carried mail and passengers up and down the Ohio River. 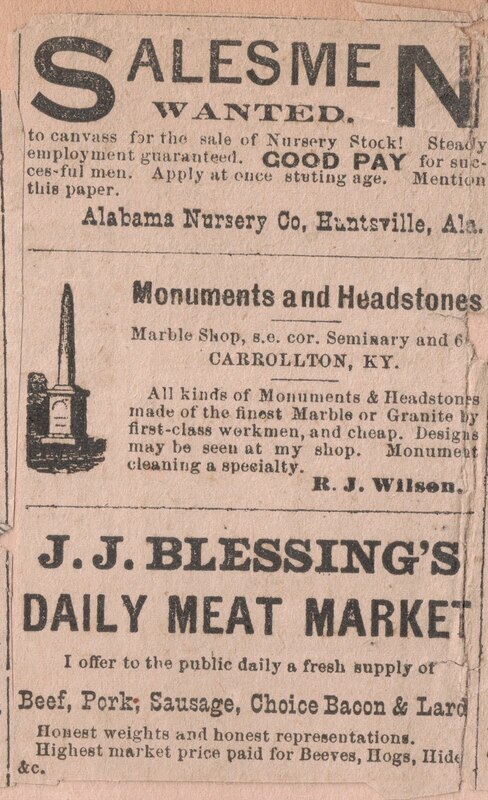 The people of Carrollton may have visited N.T. 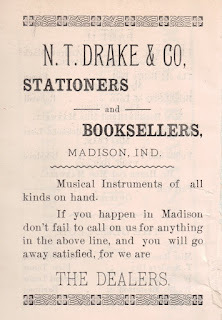 Drake & Co. for stationery and books when they visited Madison, Indiana. J.J. 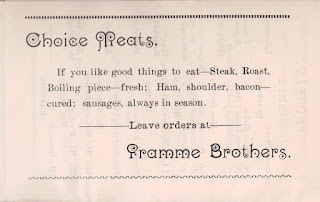 Blessing and the Framme Brothers were competitors in the meat business. 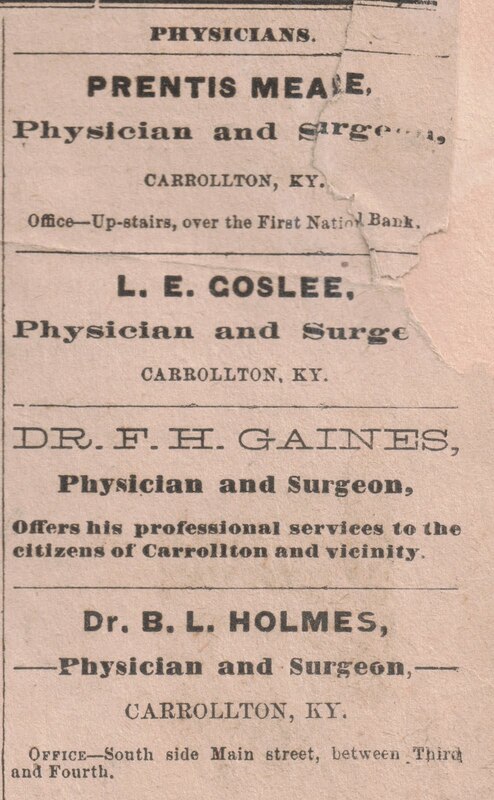 The Carrollton Democrat, of course, advertised in its own newspaper. 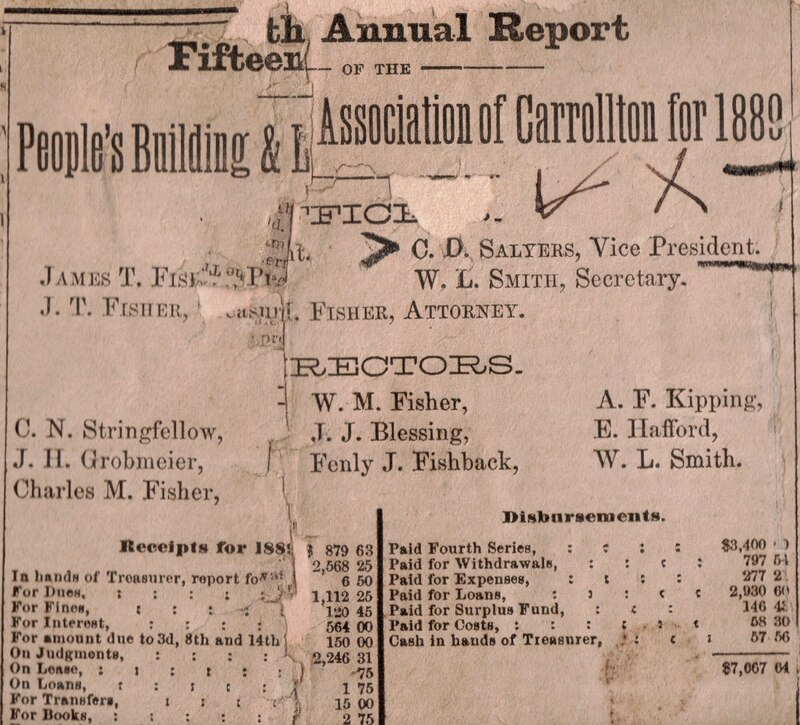 Next stop, People's Building and Loan Association, which in 1889 advertised the highlights of its Annual Report. 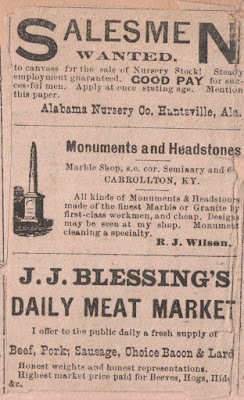 I hope you enjoyed our virtual visit to some of the businesses in 1890s Carrollton. 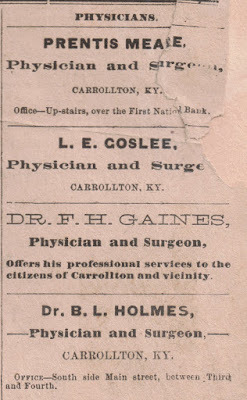 In a future post: The Howe family businesses and the impact they had on Carrollton, Carroll County, and northern Kentucky. After posting about several serious topics – school, politics, a death in the family – here's a short post on a lighter subject: Sarah's encounter with a cow! 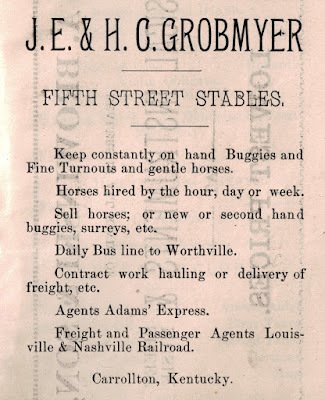 It happened in the Fall of 1896. 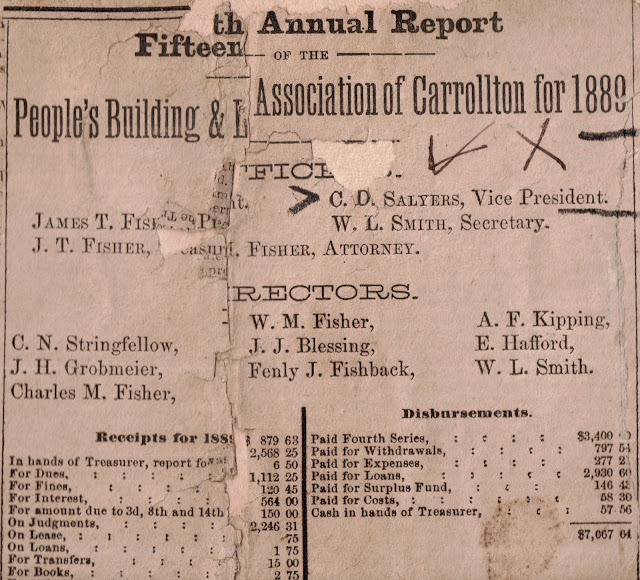 As described in "Schoolhouse Revolution of 1896-1897," Sarah's school, a private school called Carrollton Seminary (a.k.a. "Mr. English's school") permitted people to board their cows in the schoolyard. This was a win-win situation for the owners of the cows and for the school, which used the bovine boarding fees to pay school expenses. Another bonus: the grazing cows kept the grass under control. Maymie Bond (who married Pierce Winslow) lived in the little brick house across from the school, and Jenne [Howe, Sarah's cousin] and I used to go over sometimes from school during the rather long recess period we were given (generally 15 or 20 minutes). It was just before her first child was born, I remember. 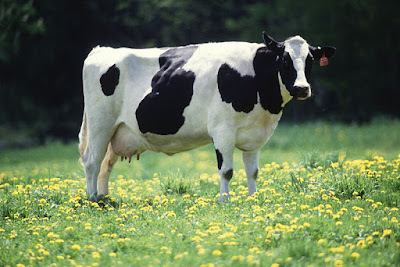 Another recess time memory I have is the time we were playing in the yard and one of the grazing cows suddenly started after me. I remember her getting up and I looked over at her and laughed and said “Why Cow-ie, did we disturb your rest?” and [name unreadable] said “She looks like she is going to disturb your rest!” And with that she put her head down and ran at me. I ran and fell down, and she went on past me and started eating again, but it was at least 25 years after that before I could pass a cow without feeling the fright of that occasion. Several of the boys who had seen the accident but sensed my fear of the cow in the yard after that were so nice, for tho I never could bring myself to ask for help, several of the boys at different times walked past me and chased the cows away from the gate as I went out and then went on, as if nothing had occurred. Would today's school boards permit cattle grazing on school grounds? 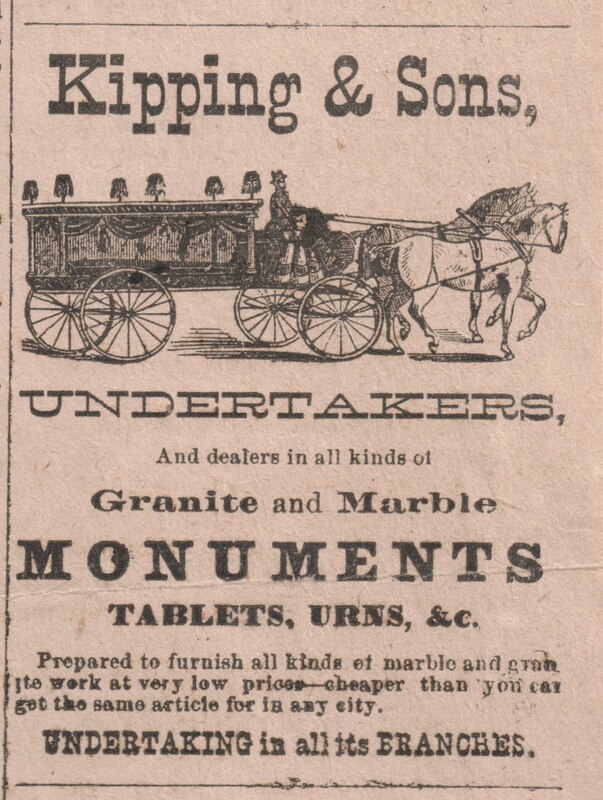 Imagine the health and safety issues! While the introduction of cattle to city school campuses might be educational, I'm confident we'll continue to have students who have never seen a cow. I'm intrigued that Sarah would not ask for help, in spite of her fear. The more I read her scrapbooks, the more I'm convinced that she was one strong little girl, and she became an even stronger woman. I applaud the boys who spontaneously protected her. They did not tease her about the encounter. They did not brag about being her champion. They simply cleared the way for her. What compassion! What chivalry! True, these boys grew up in the Victorian era, when manners were revered and males were expected to protect females. Still, I'm charmed by their sensitivity to Sarah's feelings and their willingness to help without direction to do so and without seeking recognition. Would today's middle- and high-school boys do the same? Here's a follow-up on the relationship between Sarah and cows. As my husband recalls, in the early 1950s his grandmother Sarah was visiting the farm on which her daughter, son-in-law, and grandson lived. A young cow was tethered to a fence with a chain to receive some sort of medical treatment. The cow had already demonstrated a dislike for the visitor, and it didn't help matters when Sarah tripped on the chain and fell, frightening the cow. Sarah's daughter, Mary Alice Salyers Hays, saved the day by distracting the cow with a broom. 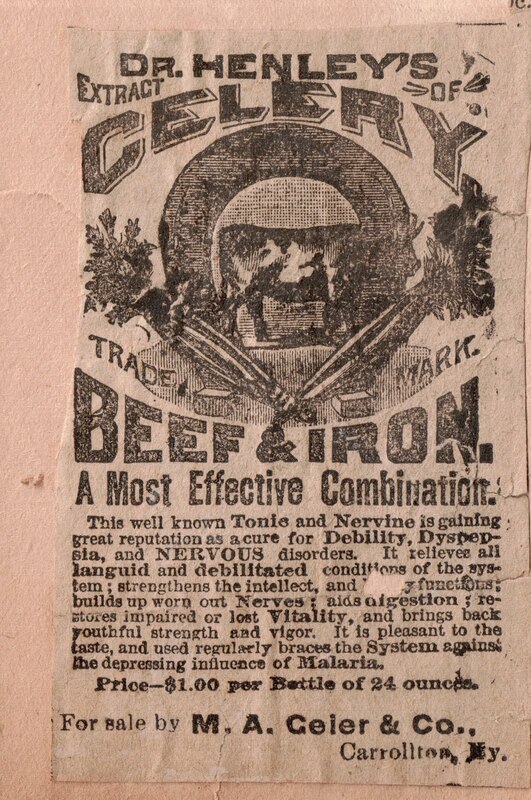 Apparently, Sarah and cows were not meant to be friends. One of the challenges of posting about Sarah's scrapbooks is that she wrote about life events as they came to her memory, sometimes years after those events occurred. When she came across a box of her grandparents' letters, for example, she pasted them into the scrapbook she was working on at the time. When she saw an amusing image in a magazine, she pasted it on a page and wrote notes about the memories those images stirred. Here is such a page. 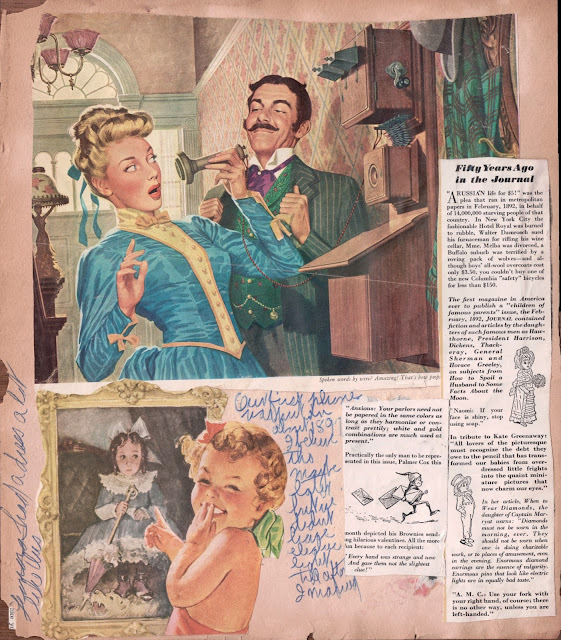 Although it shows a telephone of the 1890s, the image appears to be clipped from a magazine (possibly the Ladies' Home Journal) published in the 1940s. It prompted Sarah to recall the Howe family's first phone installed circa 1897 – about the time of her schoolyard encounter with the cow. I've included the entire page, because it includes several nuggets: her memory of that first telephone, a note about a dress her little sister wore, and a "Fifty Years Ago" column that helps assign a date to the entire page. Sarah was not good about including dates in her scrapbooks, so anything that helps determine a time frame for clippings and information is gold. Left side: "Leonora had a dress a lot like this." 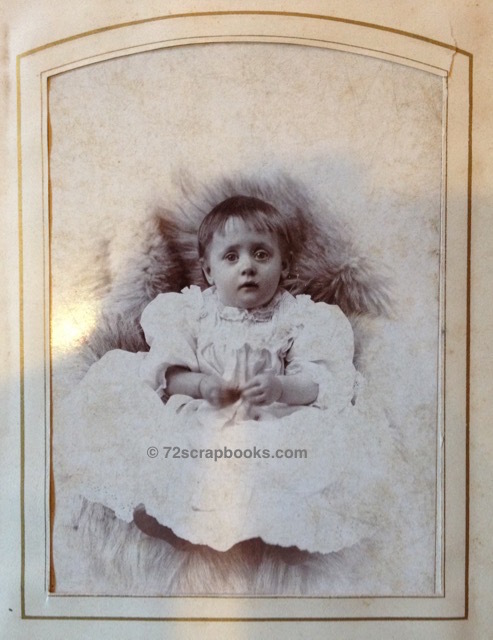 Today we pick up shortly after the birth of Sarah Eva Howe's little sister, Leonora. This Christmas, with a newborn in the house and Mama still "in her confinement" and unable to do her usual decorating, baking, and entertaining, is not as festive as usual. Papa takes the role of "Santa" as best he can and makes Christmas 1896 one of the most memorable for his daughter Sarah. The New Year brings a loss and stirs suspicion about some shady financial dealings within the family. This was the Christmas Papa gave me the Prescott’s Conquest of Mexico and Conquest of Peru; on a previous Christmas, 1894 I think, Grandma Cost [Sarah Evaline Arnet, wife of Richard Henry Cost] had sent me John North in Mexico by “Fred A. Ober,” who turned out to be a learned professor at Yale or thereabouts, I learned afterwards, so the information was authentic. I hadn’t read it for awhile, but when I finally got around to it, I became such an enthusiast on the archaeology and folklore of Mexico as set forth in the book – and then, on my birthday, 1896, she sent me The Fair God by Lew Wallace. 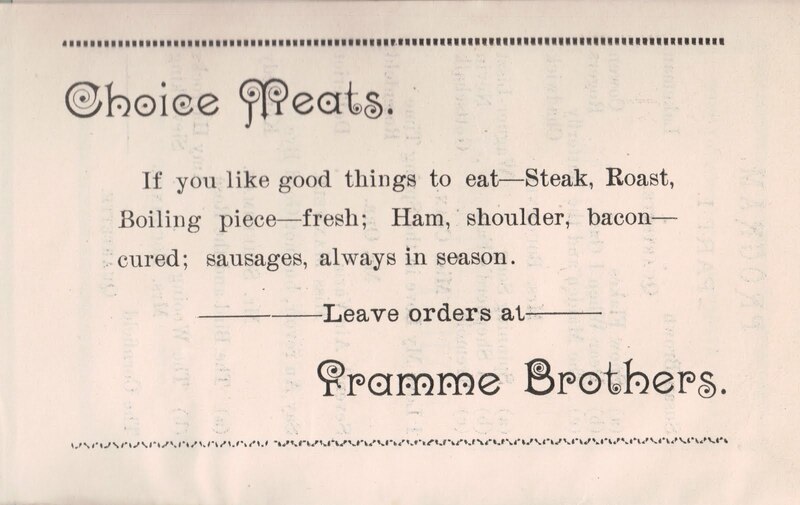 No, I am wrong – this was in 1897 and it was Christmas 1897 Papa gave me the Conquests. I have just remembered after writing the above, and will tell later what reminded me. Papa always loved to bring things from New York to put away for Christmas, especially books, and I get a little confused remembering just which year he brought which books. 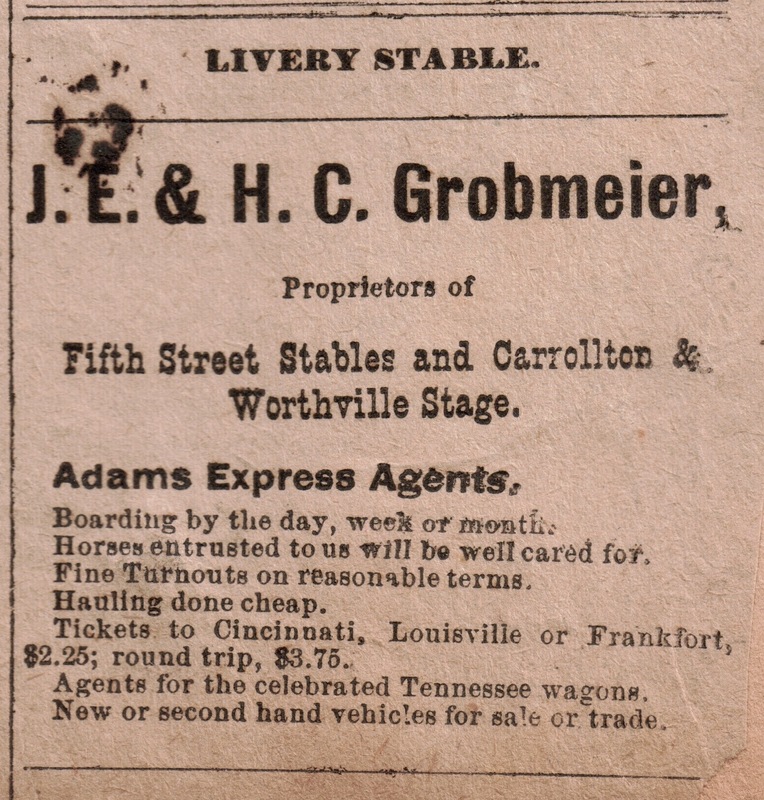 Early in 1897 Grandfather Arnet1 died at his home on Baymiller Street, Cincinnati, nearly 92 years old. Grandma Arnet2 had died in ’92 or ’93 (and after that Grandfather was very lonely and easily deceived by his grandson Ezra Cross, Mama’s cousin (Aunt Momi's3 son) who lived with him, managed his business (with considerable profit to himself – no one ever knew just how much money he got away with). Grandma Cost’s4 family asked to have a guardian appointed in 1895, and the court put in Mr. Hunt, whose reputation was a trifle shady, and whom they suspected (tho couldn’t prove) was “in cahoots with Ez,” as I used to hear some of the family say. But no one could do anything about it; and when [Grandfather Arnet] died, he left a house and $10,000 each to his two daughters, the surviving children. That there had been much more money before Ezra & Mr. Hunt’s regime no one doubted – in this way too Ezra’s mother got exactly the same as Grandma, tho she and her family had lived on Grandfather’s bounty rent free, for forty years at least, her husband being a nice man but “shiftless” while Grandpa Cost was proud ... and a “good provider” – wouldn’t even ask for an equal free rent tho he lived in one of Grandfather's houses. 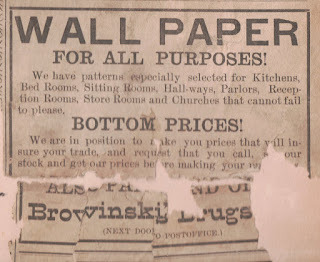 Grandma decided to sell the house on Court Street which was left to her, and the family moved into Grandfather's home on Baymiller St. She and Aunt Momi divided the furniture left from that which was sold at auction, and Grandma got a very large bedroom suit, which was later sold to Blanche, a cousin. They paid rent for the Arnet home, but they had been used to that and for the first time in years the family felt free & “well off." Names and dates in this post came from the scrapbooks and the Howe Family Bible. I was inordinately proud of the baby! I wrote to my grandmother and aunt that she had "Maltese eyes” and didn’t Granda write back to me that she wouldn’t have thought it of me to say the new little sister had cat-eyes! I remember too my delight over the clothes for the “Winter Baby.” ... Grandma [Sarah Evaline Arnet] Cost had one of the cousins (who crocheted for money) to make a wonderful white and blue sacque; it has puffed sleeves, in the prevailing woman’s styles, and a sort of ribbed effect, very elaborate. It was still the fashion for babies to wear long clothes for at least five months before they were “shortened” just as 14-year-old girls began to get their dresses “lengthened”; by the time one was sixteen, dresses should reach the “shoetops” (high shoes, of course), by 18 “the ankles,” and from then on, sweep the ground in successive waves. (It was pretty too, don’t let anyone tell you it wasn’t.) Grandma [Sarah "Sallie"Brown] Howe gave Leonora two most beautiful dresses, with delicate lace and “insertion” and “rolled and whipped ruffles." She had numerous other gifts of course. She had two, a white embroidered cashmere cloak, very long, and a white silk cap also embroidered. The heavy walnut cradle used by both Chandler [Sarah's brother, Chandler Harper Howe, born in 1888, died in 1889 of pneumonia] and myself was brought from storage for her. It didn’t rock on rockers like a chair but had a solid foundation with rollers, and the rockers moved in grooves on the crosspieces. (Mama afterwards gave it to Lee Cost Russell for her children.) “Becky” Holloway, Mama’s nurse, stayed with us for weeks. Maggie Donnelly worked for us too all that time, and for about a year or more afterwards. Maggie afterwards married Albert McMillen; they kept the restaurant where Leonora and Mama used to eat when they stayed at Miss Rose Arnett's. 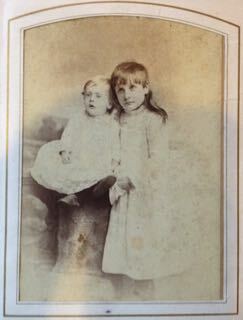 Leonora Alice Howe became an accomplished pianist and music teacher. She was the second wife of Charles Kipping, a pharmaceutical salesman based in Carrollton.She died in 1967. 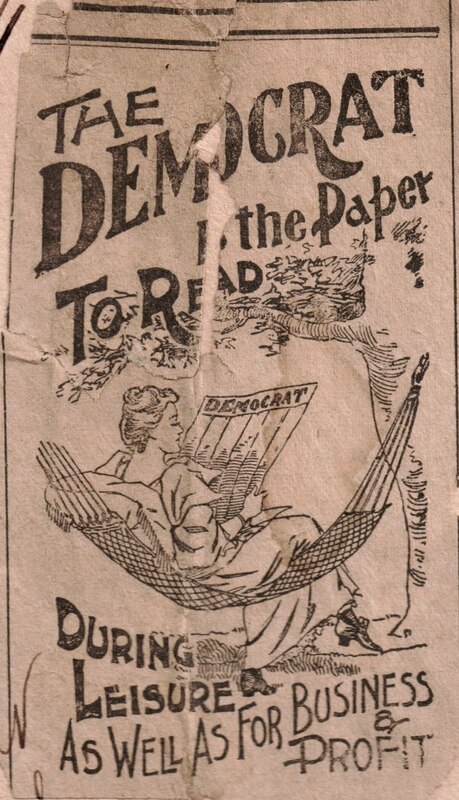 Though Sara Eva Howe was only 13 years old in 1896, she was tuned in to politics. Today, as we reflect on the contentious presidential primary and general elections of the past few years, we can appreciate Sarah's memories of the equally contentions campaigns of Democrat William Jennings Bryan and Republican William McKinley. To this day, historians call that year's presidential election one of the most dramatic and complex in American history. No wonder Sarah had such vivid recall as she wrote about it some 15 to 20 years later. 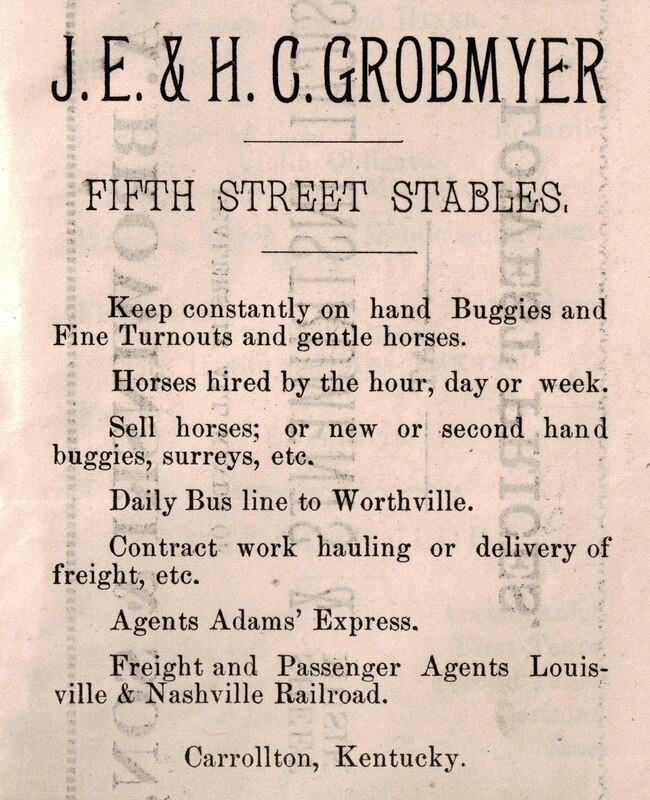 I'm no political historian, so I poked around on the internet to learn about the presidential election of 1896. 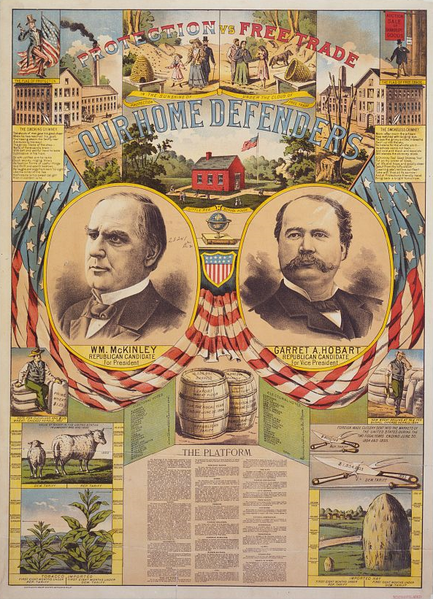 If I understand correctly, Republican William McKinley drew most of his support from businessmen, bankers, professionals, skilled workers, and prosperous farmers, all of whom stood for gold as the U.S.A's currency standard. Democrat William Jennings Bryan was supported by his own party plus the Populist Party and the "Silver Republicans." His campaign blamed the wealthy for impoverishing America by limiting the money supply, basing it solely on gold. He supported coining more-abundant silver to restore prosperity. I've added my own comments in brackets within the following transcription of Sarah's writing. 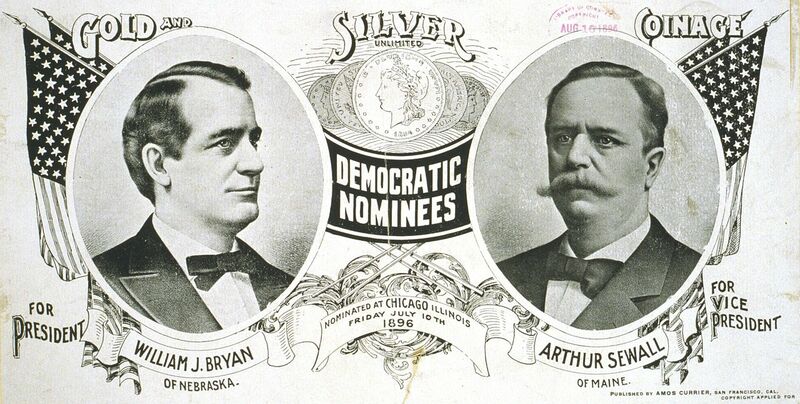 The fall of 1896 found us politically minded indeed, for it was the great gold standard, silver standard campaign, and William Jennings Bryan was running for President for the first time on a platform of “Free and Unlimited Coinage of Silver,” which many thought meant lots of silver money for everyone! Just as the cry of McKinley and Protection, or The Full Dinner Pail or even The Gold Standard prejudiced many, including my young and impressionable self, in its favor. Papa, being a Prohibitionist, was of course not directly concerned, but Uncle Joe [Joseph B. Howe] swerved from his former support of the Prohibition ticket (he voted for it before Papa did) to vote out and out Republican – so did Mr. George Winslow (also a former Prohibitionist). We privately thought their intensely Republican spouses brought this about. 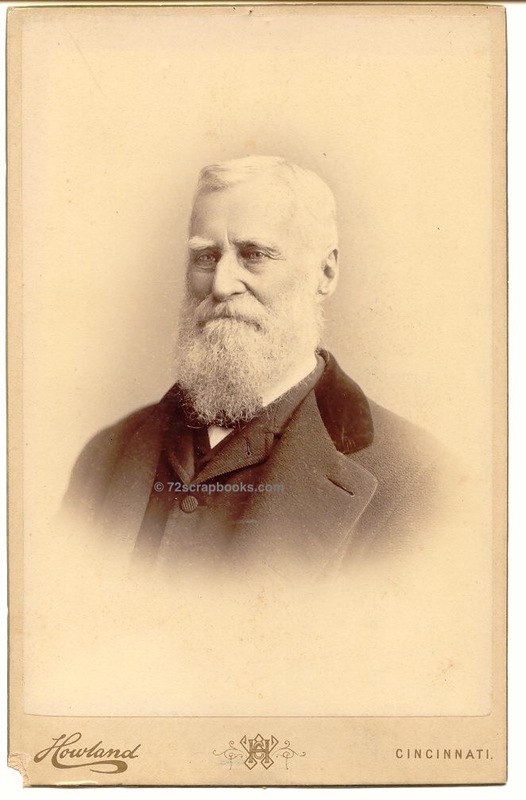 Uncle Will [William Ficklin Howe] supported the Gold Democrats, who had on a ticket Palmer and Buckner. Uncle John Smith never would tell how he voted, which was an admission of something or other. 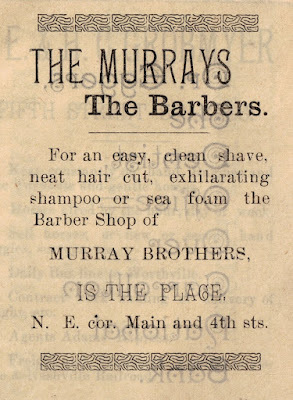 Feelings ran higher than at any election, I believe, since the Civil War, and think of what the fuss was all about – Money! 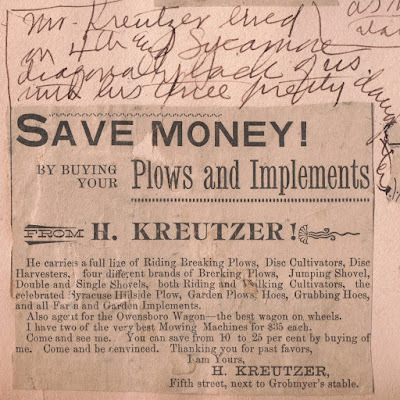 Of course, the Salyers folks [who became Sarah's in-laws in 1905] were all Republicans – and Mrs. King [probably Mary Catherine Mayfield King, the grandmother of Sarah's husband] herself was for “gold” and had many arguments with Uncle Alec Trout who was for Bryan. (Uncle Bill Fisher too was Republican.) We all wore campaign buttons, and many were the arguments in our class of six at school. 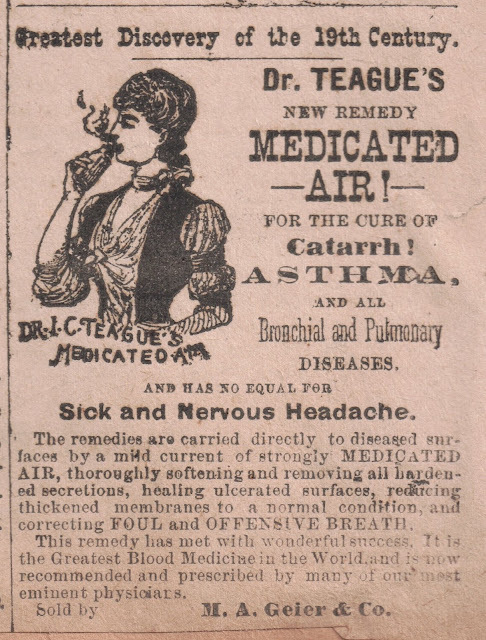 and one Prohibitionist (goldily inclined) - myself. To pursue the election excitement a little further, we were wildly excited for the returns. Papa kept coming in and telling us how it was going as he spent most of his time at the Court House and nobbing with the Republicans (as he said); they were getting their returns by wire there. By Amos Currier [Public domain], via Wikimedia Commons. On election day Nov. 3, 1896, the national voter turnout of 79.3 percent, and some places reported a turnout exceeding 90 percent. (Compare that with the substantially lower turnouts over the past few national elections!) McKinley, who had a campaign budget of $3.5 million (equivalent to $3 billion today! ), outspent Bryan 5 to 1 during the campaign and won the election with 51.03 percent of the vote. 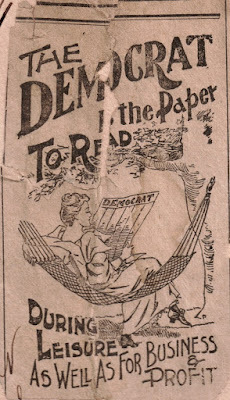 If this post stirs your interest in the election of 1896, please search the internet for articles about them. A general search finds a half-million or more sites about this topic.